The two most well-known national VegBox schemes in the UK are Riverford and Abel & Cole. Like freckles dotted in between, there are many smaller box schemes1. These are usually associated with small-scale farms and provide the ideal way for local people to access good quality, super local and seasonal produce from farms on their doorstep. 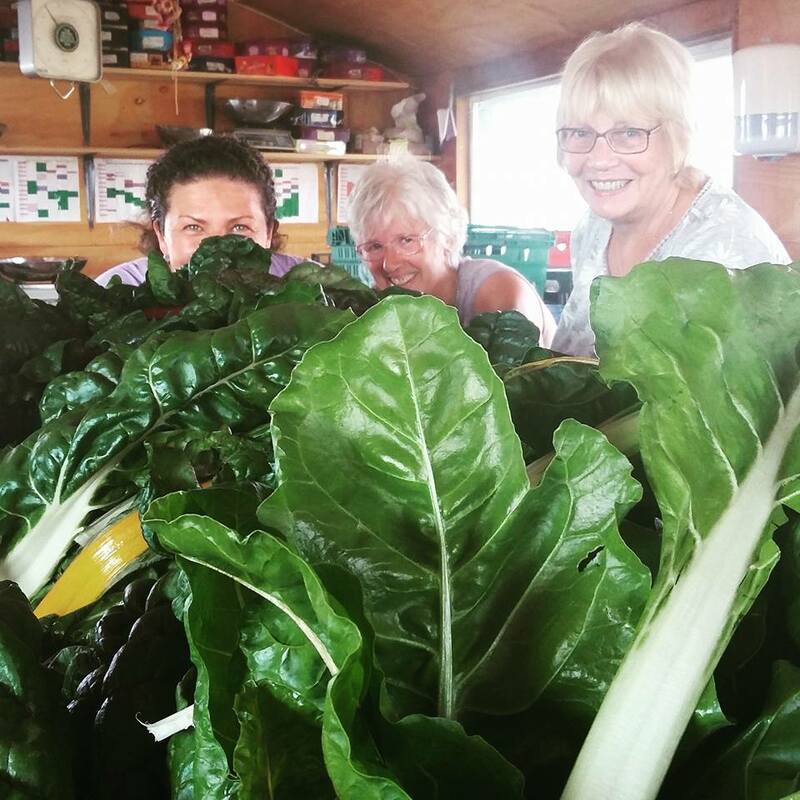 Sited on the edges of south London, Sutton Community Farm is one of these schemes and serves around 250 weekly customers. I’ve been involved with developing their box scheme over the last four years and this blog is about some of the technical systems that lie beneath the surface. Box schemes are one of the most promising ways we can re-localise our food system and support productive, more sustainable mixed-use farming systems. In terms of managing them, they are notoriously bureaucratic to administer considering the value of product sold. Each week, a new box is designed in conjunction with what crops are ready. After this, there’s the customer support, order administration, packing and managing deliveries to households or pickup points. To be financially viable, it’s vital that the systems behind the box scheme are designed to be as efficient as possible. While scaling-up can create efficiencies for an enterprise, there are challenges involved in pulling this off. It involves co-developing each element of the system from the food production to delivery logistics, the packing operation, customer service support. All alongside constant sales and marketing and remaining rooted in local food and community. Riverford is an example that shows it can be done. Despite these challenges, box schemes are enormously rewarding and honest enterprises, giving farmers a fairer price for their produce and enabling consumers access to high quality, seasonal produce. I’ve had a lot of headaches over the years running a box scheme and most of it comes down to technology. In recent years, more off-the-shelf software has been emerging to help local food distribution such as BuckyBox and the Open Food Network. This is welcome news especially in the case of Open Food Network, which is UK based and started as a collaboration between box schemes that had shared challenges. If I were starting afresh with designing a box scheme, I would opt for one of these platforms. They take a small percentage cut of the sale but to avoid the headaches of administration and system design from scratch, it’s worth it. It’s also worth mentioning new sales and distribution platforms set up to support small producers such as The Food Assembly and Farm Drop. These are aiming to disrupt the market, making it easier for small-scale producers to find their customer base. The Food Assembly is essentially a smart, modern day farmers market where customers buy in advance and this gives producers assured sales. Of course, this comes at a price and for The Food Assembly, their cut is about 16% of the sale (8% to the market manager giving them the incentive to market your business, and 8% to the central organisation). For marketing purposes, it’s important to understand where customers come from, how long they typically stay and why they leave. We’ve embedded these questions into the customer journey so they are easily captured. On signing up for a VegBox, it’s compulsory for customers to answer how they heard about the box scheme and if they cancel, we seek to understand this through email or phone, capturing this information in the database. By standardising data fields (while also allowing space for custom text too), insights data can be generated in seconds and summarised on a dynamic dashboard as shown below. Previously it would take hours to compile this data. SCF’s ordering system is custom built using Ruby on Rails. One of the reasons we haven’t used off-the-shelf software is because of the flexibility we want to offer our customers, which include features absent from off-the-shelf systems. One of the greatest challenges when building the online shop was providing a flexible Direct Debit solution so customers can have a regular order which can easily be amended, by the customers as well as an administrator. For payment providors, the cheapest and most suitable one I’ve found is GoCardless which has a good API. The routine for SCF box scheme is outlined below. Over the years we’ve aimed to minimise the time taken to process the order data and to plan the delivery logistics. When I started working on the Box scheme, this job was taking the best part of a day with many headaches and unreliable data coming out of the ordering system. Today, this job can be done in around 10 minutes if all goes to plan. The order data that is downloaded from the backend of the website is a CSV file which is uploaded into a specially designed spreadsheet that presents the data in various useful formats. The first requirement is a summary of the total orders which enables the box designing to begin straight away on Monday morning. Following this, the delivery route is established. I’ve had mixed success with route planning software in the past, mainly because it’s not just about finding the most efficient driving route. Some deliveries require time prioritisation; for example, pick-up points in pubs require delivery in the afternoon, while shops usually require delivery in the morning. Route planning software has often struggled to deal effectively with these demands. We have used software on and off and established reasonable manual systems for editing the routes each week. Recently, I have been trialing a logistics software called OptimoRoute and this is looking a promising solution, so the farm will trial this in the new year. The order spreadsheet has been designed so that data can be quickly exported into this route planning software and back into the spreadsheet, so driver sheets and bag labels can be printed off with ease. The route planning currently takes 1-2 hours per week and the aim is to reduce this to around 15 minutes. By making full use of available technologies and designing smarter spreadsheets, staff can be less bogged down in confusing spreadsheets and can focus on delivering a better product. Furthermore, the farm can comfortably increase it’s customer base with very little additional administration in order management. Box schemes are a fantastic route to market for small, mixed farms and my hope is that they have a vibrant future. While they can be a tricky product for the customer, they are also extremely rewarding to receive and help us become resourceful chefs, in tune with the seasons and better-connected with the trials and delights of local food production.